I’ve said it countless times before. 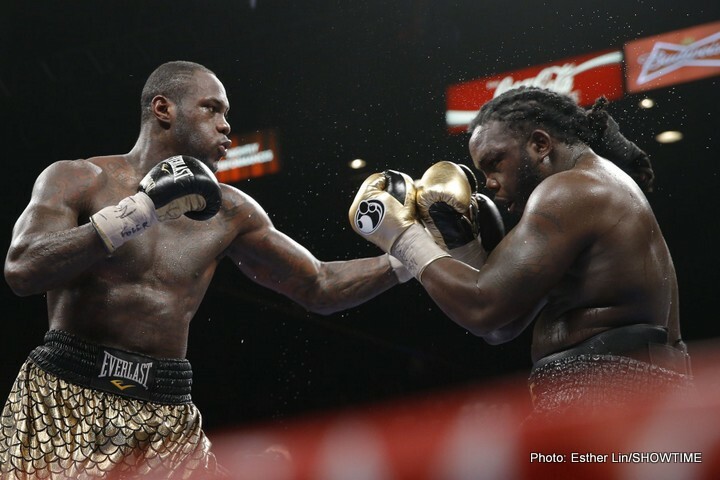 Deontay Wilder is a fighter I really WANT to like and after winning his WBC title in January against Bermane Stiverne, I’d taken baby steps toward that in terms of the Bronze Bomber answering some of the questions that fans had about him – most notably his 12 round engine and ability to take a shot. That title tells you all you need to know about Molina as a credible opponent for Deontay’s maiden defence – and whomever wrote the header didn’t do Wilder any favours did they really? I suppose that given that we now know Alexander Povetkin is mandatory for the WBC title, a fight Deontay could well end up in Russia for thanks to the huge pockets of his opponent’s Soviet backers – it makes you feel just that little bit more sorry for him. But only for a second. It’s the heavyweight championship of the world and gimme fights are rarely tolerated to this extreme at top level by the fans, whomever you are. The media day quotes, when you read into them are also very telling regarding the Al Haymon philosophy of protecting certain champions/fighters. In short, he understands he’s in as an ‘opponent’ and he’s getting a career high pay-day. The opportunity to be champ is there, sure. But he’s got to win the fu***** fight for it to truly mean anything – and that ain’t happening! Those providing a more credible test likely wanted and deserved more than the peanuts offered by Haymon and team Wilder as a percentage of the purse split. And Wilder knows damn well Molina shouldn’t deserve to be in the ring with him. He’s basically another one of the 30-odd part timers that Wilder blew out on the way up to the Stiverne fight. That was pretty much it for me! I wonder how many other ‘rabbits’ will get a crack at the WBC strap? I don’t see too many worthy ‘rabbits’ in the heavyweight division until you plumb the depths of the boxrec rankings – only guys who wouldn’t take a back step from Deontay – like Povetkin is soon to show. Challengers like Lucas Browne, Carlos Takam, Tony Thompson – there are loads of better guys for a 1st defence that fans would have been more willing to accept at different levels/stages of their career, than having to swallow Eric Molina. But this is what we are coming to expect from Al Haymon in spite of all the good he’s doing with PBC entertainment wise. Prospects like Anthony Joshua and Joseph Parker even look ready for Wilder at times when you consider they’ve each beaten 12-13 guys of the calibre of opponent Deontay dined out on for his entire pre-Stiverne career – although I’m merely stating that to prove a point. The point being I’m still not sold on Deontay Wilder and I don’t think most fans are either. Not completely. We need to see more and it needs to be against guys who are going to stretch him. Stiverne claimed to be severely dehydrated when he fought Wilder and was hospitalised after hand. Something he credits to ‘under-performing’ despite the great account of himself he gave. If Deontay is the take all comers fighter he wants to be seen as, a Stiverne rematch would have really showed the fans it wasn’t all a fluke against a fighter not at his best on the night. But did we get that? No, we got Eric Molina. And enjoy it Deontay. Because a lot of those home town fans in Alabama won’t be making the trip to Russia!